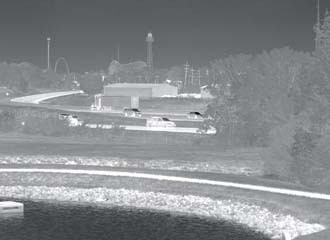 An image from a corrugated quantum well infrared photodetector (C-QWIP) shows traffic flowing along a highway near Kings Island theme park in Mason, Ohio. Note the white "hot" spots on the tires and engines in some of the vehicles and the sharp detail of the rock-lined pond in the foreground. A new form of quantum well devices sheds light on the night. A different approach to focal plane array technology is leading to better and less expensive infrared sensors for a broad range of applications. For users in the battlespace, this development will mean higher resolution images in systems that require less maintenance even in demanding conditions. Known as a corrugated quantum well infrared photodetector, or C-QWIP, the technology already has shown high performance characteristics, according to its researchers. Developed by scientists at the U.S. Army Research Laboratory (ARL), Adelphi, Maryland, C-QWIP builds on existing quantum well infrared sensor technology in use throughout the world. However, it features new approaches to light gathering that both simplify fabrication and improve performance. The ARL research that led to C-QWIP centered on developing reliable, highly sensitive, large-format focal plane arrays for light detection that can be manufactured economically in large quantities. Where C-QWIP technology fills that bill is that it can replace existing infrared detectors, such as those used on Army helicopters, to provide better performance at lower cost. Dr. Kwong-Kit Choi is a senior research scientist with the Sensors and Electron Device Directorate at the ARL. He explains that, in addition to reliable and highly sensitive detection, C-QWIP requires less calibration and maintenance. One of the top applications for these sensors is aboard helicopters, where they can support night pilotage, navigation and targeting. Compared to existing forward-looking infrared, or FLIR, systems, C-QWIP sensors can provide a larger format view. Early ARL C-QWIP systems feature 1-megapixel arrays, and scientists now are developing 4-megapixel systems. These sensors cost less than their conventional predecessors because they are made of 3-5 compounds—gallium arsenide, Choi notes. The commercial marketplace currently includes QWIP cameras with resolution as high as 0.33 megapixels. But these commercial devices do not offer either the resolution or the sensor flexibility needed for military systems. The ARL research improved on the commercial QWIP technology in several areas, but the key was to improve the technology’s light-gathering capability. Commercial QWIP sensors can absorb light only when their optical electric field is vertical to the sensor’s material layers. So, these devices must use diffraction gratings to channel light into the detection area. Grating requires a large area to be effective, so it offers reduced efficiency over a limited pixel area. Choi explains that C-QWIP technology solves that problem by doing away with QWIP grating. C-QWIP’s small pixels would be rendered inefficient by grating, so ARL scientists have opted to use inclined micro-mirrors on detector sidewalls. These micro-mirrors reflect light into parallel propagation, which creates a vertical field for the quantum well detector. Studies have shown that pixels measuring less than 25 microns can act as a resonant cavity in defining the overall magnetic field. A small change in pixel geometry can alter a detector’s quantum efficiency substantially. With a C-QWIP, each pixel is treated as a resonant cavity. Yet, electromagnetic field simulations have shown that resonant cavity effects do not play a role in this type of detector structure. So the new design achieves much higher quantum efficiencies, Choi says. Because reflection redirects light more effectively, the sensor’s quantum efficiency is much greater. And, because reflection is independent of wavelength, this type of detector preserves the material’s natural absorption spectrum. This can be substantially wider than a grating coupling bandwidth. Similarly, the same pixel geometry and fabrication process are applicable to all C-QWIP material designs because designers do not need to match any grating cavity modes to sensor wavelengths. 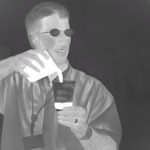 A C-QWIP infrared image shows a man pouring a cup of hot liquid, which is shown as bright white imagery, into an empty cup. The man had shifted his grip on the receiving cup as he began to pour; note the image of his fingerprints where he previously had been holding it. Consequently, the new sensors need not be calibrated in the field. Choi points out that the sensors can be calibrated once in the factory, after which they are ready for use without further calibration. As with all photon detector sensors, a C-QWIP device requires some degree of cooling. However, it does not require any exotic or elaborate means beyond those of conventional infrared sensors, Choi says. Being able to build a better device that requires less maintenance and is less expensive than conventional models begs the question of why this technology has not been exploited more fully. Choi suggests that a reluctance to abandon traditional infrared technology has inhibited a move toward C-QWIP systems. He points out that a form of this technology already is popular in Europe on both civilian and military platforms. The ARL has teamed with L-3 Communications Corporation, Mason, Ohio, to produce a functioning system. The company has incorporated an ARL C-QWIP into its own camera technology to produce an infrared scope. A licensing agreement is under negotiation, and L-3 has completed necessary infrastructure installation to begin mass production of both the sensor and its imaging device. The first Army deployments will feature 1-megapixel C-QWIP devices that operate in wavelengths of from 8.3 microns to 11.6 microns, Choi reports. Long-wave infrared imaging, which traditionally has lagged other bands in megapixel resolution, is advantageous in that its sensitivity degrades less at colder ambient temperatures. It also provides better imagery through some atmospheric obscurants, and it shows less blooming when a thermal event erupts amid an imaging scene. The first flight tests of these sensor systems are scheduled for September. As bigger arrays are developed, the systems can be upgraded. While the ARL is working on developing 4-megapixel sensors, that limit is not imposed by the detector technology, Choi explains. The sensor’s signal processing is the roadblock to even higher resolution C-QWIP sensors. If the electronic circuitry can keep up with the detectors, than sensor performance can improve dramatically. The large number of pixels combined with high frame rates requires the use of high-speed electronic components, and the availability is limited for those types of components that also offer low noise. L-3 currently is developing low-noise, high-speed sensor electronics for C-QWIP sensors. After the 4-megapixel sensor is developed, ARL researchers will focus on other improvements. These include being able to detect more wavelengths, such as broadband focal plane arrays for spectroscopy. Another target is the development of medium-wave/long-wave two-color focal plane arrays. Ultimately, researchers hope to develop C-QWIP sensors for very-long-wavelength infrared that could be used by astronomers to detect cold objects in space. These would be useful both for missile defense and for deep-space astronomy. Some C-QWIP sensors already have proved their worth recording missile launching and intercept imagery. Turning to Earth, NASA has been evaluating C-QWIPs for use on a future Landsat remote sensing satellite. The Landsat 8 Earth observer currently is slated for launch in December 2012. The C-QWIP units delivered for evaluation have met all mission requirements, Choi offers. The ARL’s C-QWIP technology also has commercial applications, Choi adds. Security applications are high on that list, particularly for facility and border security. Industry can use it for inspections and quality control as well as for robotic guidance. Natural resources observation and mineral exploration also could benefit.